In my ol’ time Gospel voice: I have deciiiiiided to follow Jesus. I have deciiiiiiiiiiiiiiiiiided to faaaaaahhhhhhhhhhhllow Jeeeeeeeeehhhhheeesus. I have deciiiiiiiiiiiiiiiiiiiiiiiiiiiided to follow Jesus. No turning baaaaaaaaack. No tuuuuuuuuuuuuuurning baaaaaack. I wish you were here now to hear me sing in my old time Gospel voice. I love hearing older people sing. I love it, I love it, I love it!! What I was actually going to say is that I have decided to post more…well, maybe twice a week. So, check back, ya hear? Ants on the ground. Of course, I started hearing this song in my head: “ants on the ground, ants on the ground, everybody’s about to be talking about the ants on the ground…of my kitchen.” Mmmmmmmmmmm-hmmmmmmmmm. I could see all of my dinner guests starting to chant together “ants in the ground, ants in the ground, Kelley’s ’bout to be clobbered because there’s ants in the ground…BEEF! !” They probably wouldn’t even know. Hmm. Maybe I’ll put the Windex up (I can’t find the Ant & Roach spray right now, alright??) and embrace it. The craziest thing about that American Idol song is that it really fits this situation in more than one way. Some of those ants REALLY had “gold in they mouth” and one even had his hat turned sideways. I had to look REALLY closely (ant hats are tiiiiiiiiiiiiny), but I saw the sideways bill. Seriously, though, how did those stinkin’ ants get in here, for cryin’ out loud? Was it the trail of Lorna Doones I left from the cracked back door to the inside of my kitchen? Was that it? 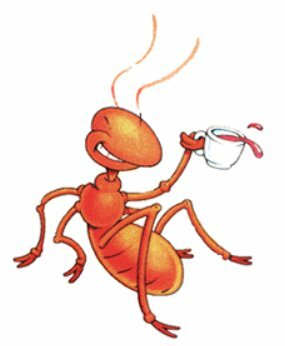 When I saw one ant up there eating his Lorna Doone & enjoying some coffee, I almost lost it (where did he find that tiny cup anyway??). Those ants really turned my plans around. I had to stop what I was doing (polishing door stoppers & shining the screws in the light switch plate), sweep, spray, kill, demolish, smash and mop. Although I loathe mopping, I got the blasted thing out. I am rather efficient mopper, however. You see, I only mop where I know people have walked and dropped eggs, applesauce, milk, green beans, bread, milk, applesauce, milk, waffles and milk. Chris can be so messy… Thus, the corners of the room have never been mopped. No one steps there! Why waste the energy?? I’m kidding, of course (I’m searching your eyes to see if you believe me). Anyway, now that the ant carcasses have been laid to rest & the floor has been mopped, I have got to start cleaning the outside brick grout. I hope I don’t run into any angry ant relatives out there. I especially hope not to see one of the aunts of one the ants I destroyed. I have heeeeeeeeeard about her! Aunt Ant is known to be quite nasty! And, yes, I kept that tiny ant hat. Y’all have got to see it. I also swiped the gold out of that one ant’s mouth. I plan to go to the local gold selling shop and trade it in. I will probably get $.0000000002 cents, but money is money! It’ll add up!